Sabrina Cipullo is a Marie Curie Early Stage Researcher in Environmental Science at Cranfield Water Science Institute, Cranfield University. She has a Masters of Environmental Science and Biotechnology from the University of Milan, and a BSc in Biotechnology. Her PhD (part of REMEDIATE) focuses on environmental chemistry and toxicological approaches to site assessments. “During these three years of my PhD, I took part in multiple exhibitions, talks, debates, and promoted hands-on activities to sparkle a stimulus for change, and to teach (and learn!) more about science. It all started when I showcased my research at the University’s 70th anniversary, Cranfield’s Festival of Flight and Exploratorium in September 2016, an event that aimed at engaging young people from the local area (with over 6,000 participants). In my second year, I was fascinated by the impact that our research can have on the wider community and I believe that inspiring children and young people is a key part of our work, so I became a volunteer STEM ambassador. I enjoyed going in to different schools and presenting my work to over 200 children in different interactive settings (presentations, lectures, and a Q&A in panel format). Kids were always very curious about recycling, climate change, and contaminations. They also asked a lot of questions about career choices and motivation/drivers to become a scientist. 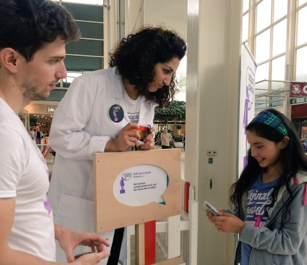 Then in 2017, I was delighted to be selected as a speaker for Soapbox Science Milton Keynes, which aims to promote female scientists by engaging with the public through interactive talks and engaging demonstrations. Hands-on activity for kids which involves creating bacteria (from play doh) from pictures of real hydrocarbons degraders. “Because my work successfully enables a diverse audience (from kids to adults) to participate in research conversations, establishing relevance and building trust around complex topics. 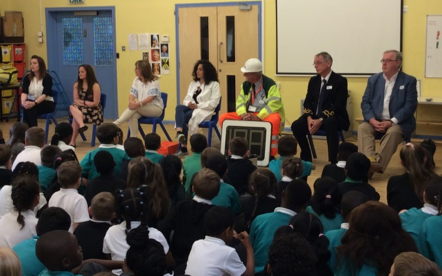 Hopefully I have inspired some children to be the next Elon Musk, Helen Sharman or Tim Peake. I have always put a lot of energy and efforts in developing more than just my research. 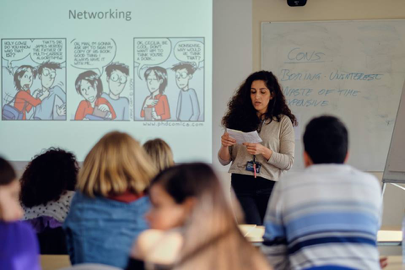 I believe that sometimes PhD students tend to focus only on their topic, forgetting how important networking and engaging with the wider community are. Note: Top photo of Sabrina presenting at STEM. Cranfield University: My perfect fit! Sabrina Cipullo is a Marie Curie Early Stage Researcher in Environmental Science at Cranfield Water Science Institute, Cranfield University. She has a Masters of Environmental Science and Biotechnology from the University of Milan, and a BSc in Biotechnology.